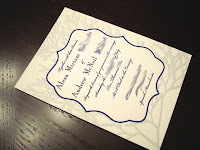 It was almost a gift of fate when Alexa reached out to me to help design and print her wedding invitations- we had actually exchanged design elements for our weddings a few months previous, so I was already a big fan of Miss Alexa. She was looking for something "kind of beachy but not really a beach theme" and provided a few online card stock samples of what she was thinking, but with the colors: navy, silver, chartreuse, and fuchsia in mind. How BEAUTIFUL is that? Just the sound of those colors together makes me want to swoon! 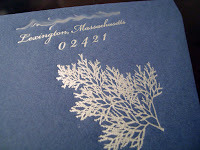 Together we developed an idea of a vintage coral invitation- something with texture and simplicity, but not to whimsical or stuffy. Modern-Vintage Coral. I was instantly in love. Alexa's brilliant eye for design found a perfect coral image that complemented the design scheme like none other, and was a dream to print. The texture of it's jagged edges came ALIVE when it was pressed into the paper. 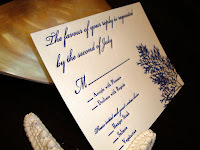 The 5x7 invitations are printed on a pearl while 100% cotton paper in a light silver treatment and navy text. 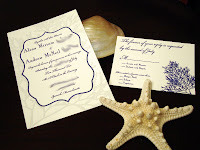 While the silver produces more of a grey tone once printed via letterpress, it instantly warms and modernizes this vintage coral design while also tying into the response cards in a matching navy. 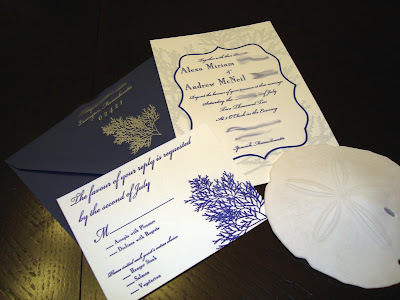 The matching navy envelopes, perhaps one of my favorite elements of the invitation suite, is also one of the most important; they were printed in a bright silver ink and provides the recipients of these beauties the first glimpse of Alexa's vision. Thank you, Alexa, for allowing me to be apart of this with you! I now happily (and very excitedly) introduce to you all: Modern-Vintage Coral*! *Names and personal information have been removed for the privacy of Miss Alexa. Liz that is beautiful! I am impressed! They look even better then I imagined! Can't wait to see them in person!